Here is Obama's most recent in your face lie/deception. Obama plans to push forward with the feds taking control of the internet against the will of a vast majority of the American people. In Democrat fool-ya fashion, he claims he wants to “save the internet”. Obama is lying. His intention is to add another notch on his gun of government overreaching power grabs. Sen. Mary “voted with Obama 97% of the time” Landrieu has been deceiving her constituents for 18 years; promoting herself as a champion for blacks and women. She is neither. Finally, Louisiana blacks have begun to realize the truth and are pushing back. Praise God! Dr Wayne Dyer says that when you squeeze an orange, orange juice comes out because that's what's inside. Squeezed by low polling numbers, Mary Landrieu's superiority, arrogance, condescension and true contempt for her constituents came out during an interview. 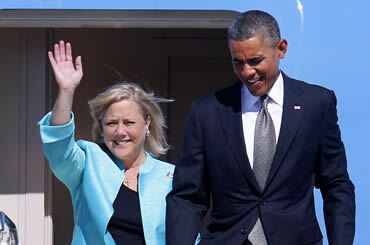 Landrieu blamed Louisianan voter's rejection of her and Obama's agenda on southern state racism and sexism. In essence, calling Louisiana voters a bunch of ignorant redneck racists and sexists. But folks, Landrieu was simply following the Democratic Party's disrespect for the intellect of voters standard fool-ya play book. When all else fails, lie/deceive, demonize and create hate. When Republican Congressman Paul Ryan proposed a plan to save Medicare, Democrat minions produced a deplorable ad to deceive voters and demonize Ryan; depicting him pushing a helpless terrified gray-haired grandmother in a wheelchair over a cliff plunging to her death. Meanwhile, Obama cut Medicare by $718 billion dollars. The Democrats deceived many into believing that Republicans had a war on women. Meanwhile, guess who has a history of keeping women in chains? Answer: The Democrats. In 1964, Democrat president Lyndon Johnson implemented government welfare programs promoted as his “war on poverty”. Twenty-two trillion dollars later, government playing Robin Hood by taking from the rich and redistributing to the poor, progress against poverty has been minimal. Democrat government dependency programs mixed with the lowering of moral and cultural standards have left the black family and community in shambles. The mission was never about ending poverty, but rather addicting blacks to government handouts to secure their votes forever. If black empowerment is truly their goal, why would the NAACP, the Democrats and MSM celebrate thugs while, not just hating, but seeking to destroy real black achievers? The answer is simple. The Democrats and their minions are great deceivers whose sole mission is to secure loyal black voters at any and all cost. Thugs Trayvon Martin and Michael Brown help to promote the Democrats' narrative that white cops shoot blacks at will; vote for us to keep them from murdering you. Evil deceivers produced an outrageous ad claiming that if blacks do not vote, they need to send their kids to school wearing bulletproof vests to protect them from police. Beyond the pale. A bottomless gutter shameful tactic. The Democrats' modus operandi is to deceive, deceive, deceive. Democrat Charlie Rangel tried to portray the decent hard working patriotic members of the Tea Party as white racist segregationists. Totally absurd, divisive, evil and deceptive. It has also been exposed that Obama and his great deceiver minions used deception and the assumption that the American people are stupid to pass Obamacare.